This article is to show you how to pass data from Campaigner into SurveyTown. Once the customer data gets passed to SurveyTown, it can be used to personalize question text. Additionally the same mechanism can be used to store Campaigner field data beside your survey responses so you can then segment and report your survey data using the data that has been passed in. Store Campaigner custom field data along with a survey response so that you can use that data later to analyze survey responses. 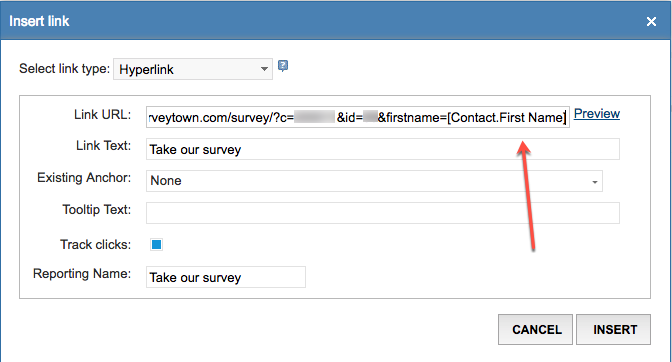 Here's how to setup a Campaigner email to send data into SurveyTown. First you need to setup your survey to expect the first name from the Campaigner URL. We will also set the default value to "Valued Customer" so if the first name is not present we will show the text "Valued Customer"
When the customer receives the email, the firstname URL parameter will be filled in with the customers actual first name. When the user click on the link SurveyTown will pick up on this personalization and customize the survey. We are adding 'storeid' to the URL using the Campaigner Merge Field using the same process as above. The process of taking the survey will be the same. 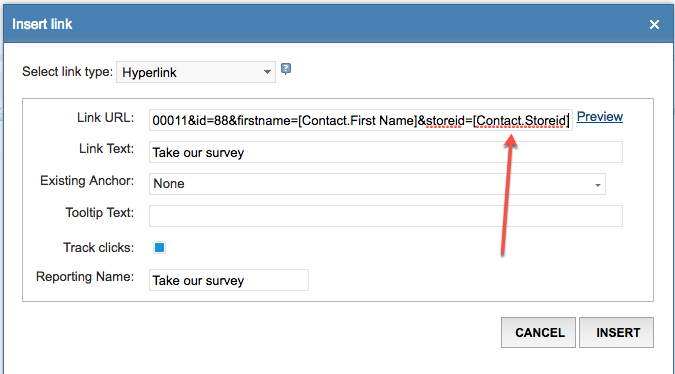 When the customer comes to the survey, the URL variable will also be stored in the response. So for example if you also added a store ID, that data would be stored in the responses. Then, you can then download the responses and slice-and-dice using the data you passed in from Campaigner next to the survey response.